Solar System - Planets and objects orbiting Sol (our sun). Our solar system is named after its central body: Sol (our Sun). It really is the center of the whole system. It produces most of the energy created in our solar system, all bodies in the solar system orbit it in some way and it is roughly at the physical center of the solar system. Prior to the formation of our solar system this location was a cloud of gas and dust. This nebula was made up of materials created in the supernovas of previous stars. We know this because of the large quantities of heavier elements around us that can only be created in a supernova. Speaking of supernovas, one happened near our system that caused the gas and dust to compress. This denser cloud then began to pull itself together because of its own gravity. As the ball shrank it began to spin faster and faster much in the same way that an ice skater speeds up when they pull their arms and legs in. This spinning caused the ball to flatten out into a disk. The disk is the planetary disk and might look similar to the rings around saturn. Some of the rocks get bigger and bigger by collecting all the material in its orbit. Once one of these rocks has cleared it's orbit of other stuff it is considered a planet. In the middle of this spinning disk would be a large ball of gas. There is enough mass and gravity to create immense pressure. So much pressure that fusion begins and our star is born. As the sun begins to fuse atoms it also begins to blow a mean solar wind made up of very hot particles. This wind blew all the gas and dust away from the inner solar system which is one of the reasons why there is little gas and other small particles in this region. The four inner planets Mercury, Venus, Earth & Mars have very little gas around them. They are mostly made of rock, have dense cores and are rather warm inside and out. The dividing region between the inner and outer planets is the Asteroid Belt. It has hundreds of thousands of ojects over 1km in diameter. Even though it has so many objects, they are so spread out that most satellites pass right through it without issue. The belt might be a ring around the sun like those around the Gas Giants, but scientists think it's just matter that never coalesced into a planet due to the gravity of Jupiter. Beyond the Asteroid are four large Gas Giants: Jupiter, Saturn, Uranus & Neptune. Farther from the sun they were able to retain much more gas and dust resulting in massive atmospheres, rings and multiple moons. The planets themselves are mostly hydrogen & helium, turn very quickly on their axis and have large persistent weather patterns. The outer planets make up 99% of the mass known to orbit the Sun. There is a region beyond Neptune that contains many small icy objects some of which are large enough to be called dwarf planets. There are over 100,000 objects of 50km or more though the entire mass of the Kuiper Belt may be less than one tenth that of the Earth. Between the stars there is a space called the interstellar medium. The Solar Wind travels at about 400km per second ans slows down when it first encounters this medium at the Termination Shock. 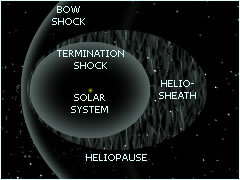 The area outside the Termination shock where the Solar Wind still has some effect. This swirling mass is stretched into a long ellipse as a result of the Sun moving through the interstellar medium. The boundary between our solar system and interstellar space where the Solar Wind no longer has any effect. 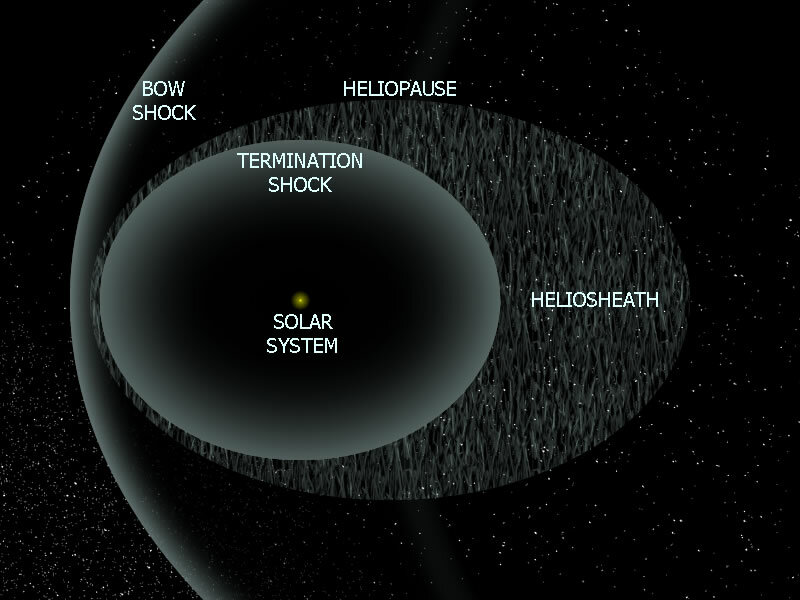 The shockwave our Solar System makes moving through interstellar space not to be confused with the Heliopause. A sphere of material around our Solar System. This would include all matter ejected from the Solar System by interactions with the outer planets. 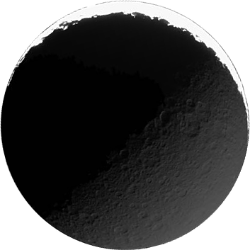 It aslo includes nearby small objects that are effected by the Sun's gravity. They all move slowly and are sometimes large enough to be considered dwarf planets.